My 5th great-grandfather, Philburd Wright, was born in Maryland in 1750, the son of Richard and Nancy Wright. Philburd became an Associator for Fredrick Co, Maryland on Dec. 27, 1775 (a member of the Maryland Militia), and was one of 9,000 men who took the Oath of Allegiance and Fidelity to Maryland in 1778 during the American Revolution. The Oath of Fidelity, instituted by Laws of Maryland 1777, stated that every free male 18 years and older was required to subscribe to an oath renouncing the King of England and to pledge allegiance to the revolutionary government of Maryland. According to "Indiana Magazine of History," by Emsley Wright Johnson, among the early settlers of the Territory of Indiana was a large family of Wrights, who emigrated from Randolph County, North Carolina, and settled in Union County in 1813. From Union County a portion of them went to Wayne and some to Washington County. Later, four of the sons went to Marion County. Philburd Wright took up his residence in Union County near Brownsville. He had served as Justice of the Peace for almost forty years in Randolph County, North Carolina. 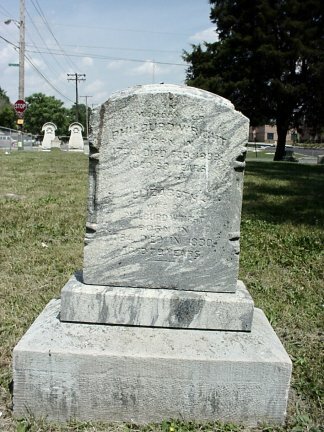 Philburd Wright died in Indianapolis on Feb. 18, 1833 and is buried at Mars Hill Cemetery in Marion County. The inscription on his tombstone reads: "Husband to Elizabeth Reagan. Father of Caroline D., Filbert, Joshua, Mattie, Sarah, Mary, Noah, Eli, Levi, Joel, Jessie, Elizabeth, Aaron Wright. Left a proud legacy." Philburd married Elizabeth (1754-1830) about 1824 in what is now Clinton County, Kentucky. Their granddaughter, Susan (Joshua's daughter), married Azel Means about 1824 in what is now Clinton County, KY. Azel's family had moved from Randolph County, N.C. to Overton County, TN in 1807 and then settled near Sulphur Creek in Clinton County about 1820.